An employee places ingots of 99.99 percent pure gold on a cart at the Krastsvetmet non-ferrous metals plant, one of the world's largest producers in the precious metals industry, in the Siberian city of Krasnoyarsk, Russia September 22, 2017. LONDON - Gold fell on Monday as the prospect of a fractured parliament in Germany after Chancellor Angela Merkel’s less than resounding election victory knocked the euro lower. Consequent dollar strength helped to push gold back towards Thursday’s low of $1,287.61 an ounce, its weakest since Aug. 25, which fed into a second straight weekly decline for the metal. 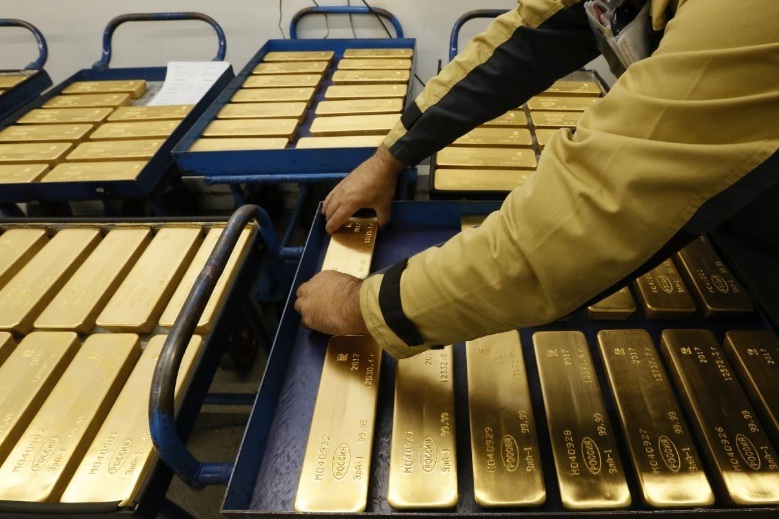 Spot gold was down 0.3 percent at $1,293.75 an ounce by 1405 GMT, while U.S. gold futures for December delivery were 60 cents lower at $1,296.90. Gold has now slipped nearly 5 percent from the more than one-year high it hit on Sept. 8, largely on the back of concerns over North Korea’s nuclear ambitions, which have now waned. “The strength in the dollar index ... and not (a) further escalation in geopolitics is impacting the price of gold,” said Naeem Aslam, chief market analyst at ThinkMarkets. The euro slipped by 0.6 percent against the dollar and southern European government bonds sold off after the German election result sparked fears of a more hardline stance towards the euro zone in the bloc’s largest economy. Weakened by a surge in support for the far right, Germany’s Merkel will have to sound out partners to build a coalition government after securing a fourth term as chancellor in Sunday’s election. There was also speculation that uncertainty after the election could reduce the likelihood of the European Central Bank trimming back its monetary stimulus programme, a move expected to be announced next month. Gold has also come under pressure from rising expectations that the Federal Reserve will lift U.S. interest rates once more this year and start trimming the $4.5 trillion in bonds and other assets it built up after the 2008 financial crisis. Physical gold demand remained soft in the major Asian markets last week despite lower prices, with consumers awaiting further dips, while a government move to bring transparency to bullion trading kept buyers on the sidelines in India. Silver was 0.3 percent down at $16.90 an ounce after falling more than 3.5 percent last week in the biggest weekly decline since early July. Platinum was up 0.3 percent at $932.90, off an eight-week low hit on Thursday, while palladium gained 0.4 percent to $920. Gold fell on Monday as the prospect of a fractured parliament in Germany after Chancellor Angela Merkel’s less than resounding election victory knocked the euro lower.